20% bigger yet 30% lighter, making it more spacious for baby and easier to lift and go for use around the home. A separate reflux leg slots in place at one end of the SnuzPod, providing a gentle elevation to help soothe and comfort your baby. Two breathable mesh sides help promote airflow and allow you to view your baby at all times. Nothing compares to waking up next to your happy smiling baby, and the peace of mind of having them close to you all night long. A zip-down wall makes night feeds convenient and provides baby with their very own safe sleeping space. With 9 height settings, SnuzPod attaches perfectly to both divan and framed beds using adjustable straps provided. No need for a separate Moses Basket! The lift-off bassinet is super lightweight (4.1kg) and extra spacious. 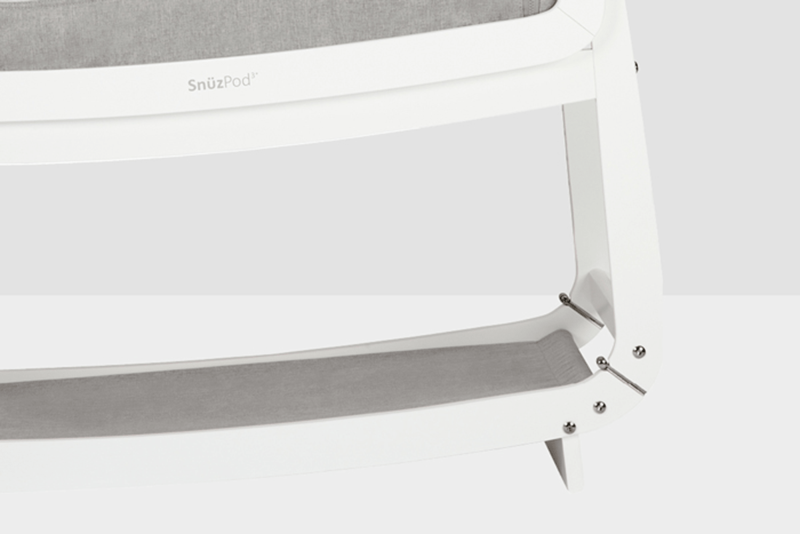 SnuzPod is always by your side, meaning your baby has one consistent sleep environment. 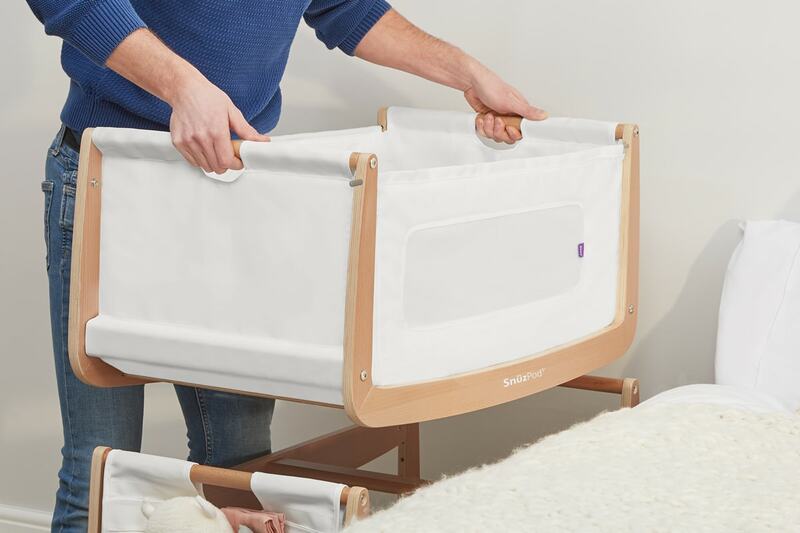 When it’s time to make the transition from bedroom to nursery, SnuzPod3 can be used as a stand-alone crib with a rockable stand that helps soothe baby to sleep. Designed and engineered in England, SnuzPod3 is beautifully made using natural beech wood, without the use of MDF or veneer. 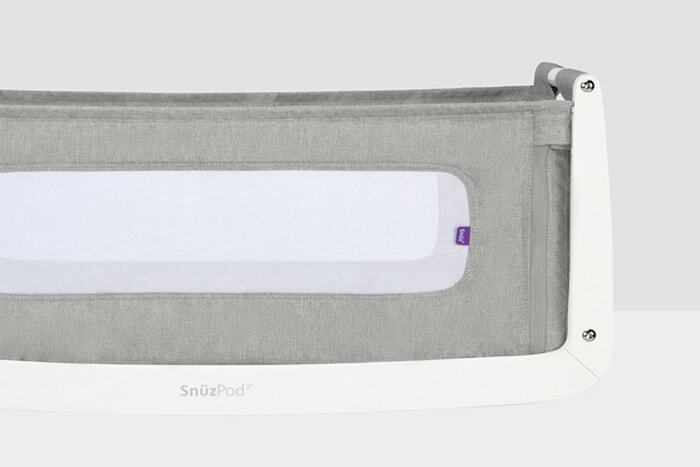 SnüzPod is the only bedside crib to receive the prestigious Queen’s Award! Made only with materials certified to Oeko-Tex 100 Class 1 (Baby), guaranteeing no harmful chemicals or substances. How does it attach to my bed? Straps provided are compatible for both Divan and Framed beds. The strap goes around the stand of the SnüzPod and through the frame or base of the bed, before clipping together and being pulled tight. Does the crib require assembly? Yes. Assembly can be done by one person and takes around 45 minutes. All parts and tools are included. Yes. The fabric part of the crib can be removed and washed by hand. Will it fit my bed? 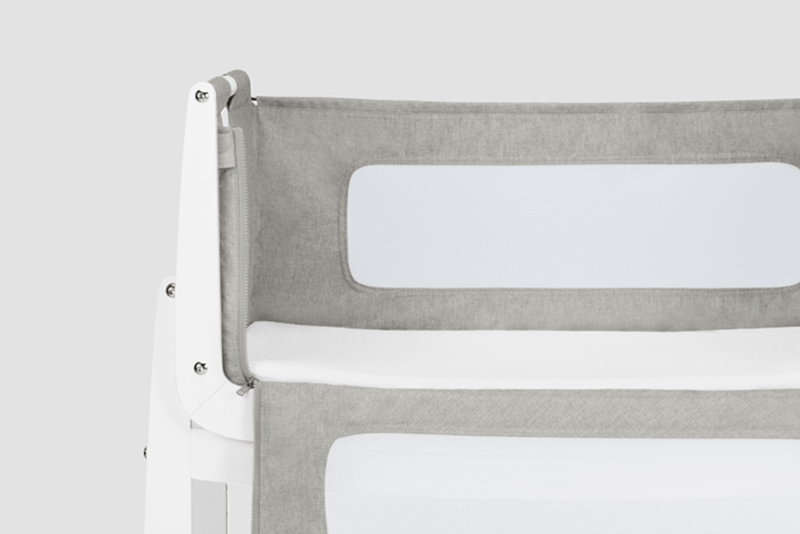 SnüzPod fits both divan and framed beds, fitting flush to parents’ mattresses up to 58cm. However, the zip-down front wall is specially designed to be safely used with taller beds to a maximum parent mattress height of 63cm. How does the reflux tilt work and is it included? Yes, every SnüzPod3 comes with a reflux leg which can be attached to either end of the crib, depending on which side of the bed it is placed. This has the affect of raising one side to help reduce reflux symptoms. The crib is really beautiful. It feels like good quality and was easy to put together. Hopefully baby will sleep soundly in it! Simple lines, beautiful design. Good material. Easy assembly. Perfect bedside cot. Many thanks! Solid wood construction and beautifully made. Added bonus of being able to separate the crib from the stand and then move to another room during the day. Love it! Beautifully made and can’t wait to use when baby is here! 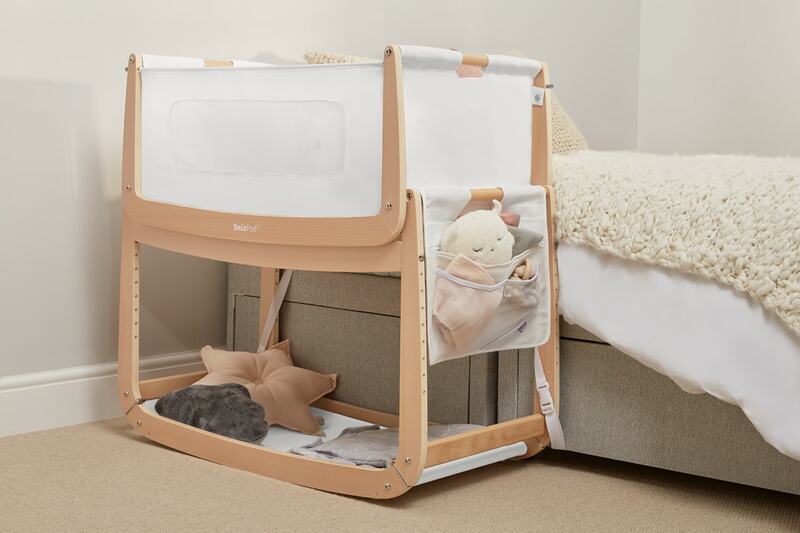 Very easy to put the snuzpod together, I was able to do it without the help of my partner, my baby hasn’t arrived yet but I’m sure it will love it, the mattress seems comfortable and there appears to be a good bit of room in it aswell!